Muhammad Lukman used cannabis oil to treat patients who were suffering from certain ailments. Prime Minister Tun Dr Mahathir Mohamad. When asked to comment on the matter at the Conference of the Electric Power Supply Industry (CEPSI 2018), he simply replied, "No, I think we should review that," reported Malay Mail. Permatang Pauh MP Nurul Izzah. Speaking to The Star Online, Nurul Izzah said, "Yes, we are following up. Personally speaking, I am writing an appeal to the Attorney-General - first and foremost to secure a pardon based on the merits of his case and predicament." Additionally, she is looking into eventually decriminalising the use of cannabis oil for medical reasons. Nurul Izzah had previously called upon Health Minister Dr Dzulkefly Ahmad to look into Lukman's case on 6 September. He was arrested in 2015 along with his wife, who was five months pregnant at that time. The child is now three years old. Lukman (right) and his wife during their arrest in 2015. According to The Malaysian Insight, Lukman was found to be in possession of three litres of cannabis oil and 279g of compressed cannabis. His lawyer, Farhan Maaruf, argued in the Shah Alam High Court that Lukman was an "alternative health practitioner" who used the cannabis oil to treat patients who were suffering from ailments that were difficult to treat with legal medicines. In some cases, he provided medicinal marijuana for free to those with low income. 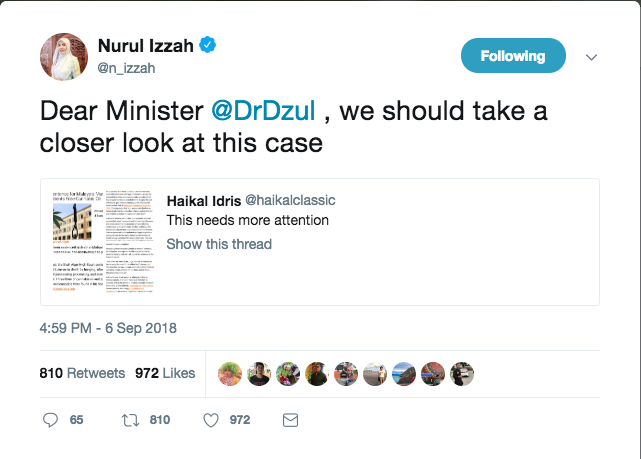 Twitter user Haikal Idris brought the news of Lukman's sentencing to mainstream attention by sharing an article by Talking Drugs on 6 September, which was then retweeted by Nurul Izzah. On 9 September, Star Online news editor Martin Vengadesan called for the legalisation of marijuana in his column "Watching The World", adding that "many more lives could be lost as we procrastinate over making a bold change". 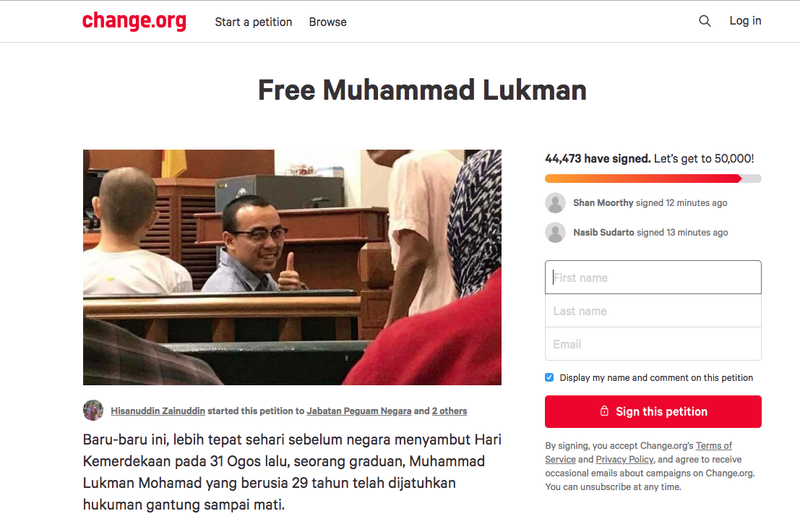 On 11 September, a petition on change.org was launched to "Free Muhammad Lukman"
A screenshot of the petition page taken today. The petition was started by a user named Hisanuddin Zainuddin, whose change.org profile reads "I'm supporting Medical Marijuana as my wife & relatives are cancer survivors partly with the usage of CBD oil". To date, the petition has garnered over 44,000 signatures of its targeted 50,000. The marriage, which was approved by the Kelantan Syariah Court, took place in July. 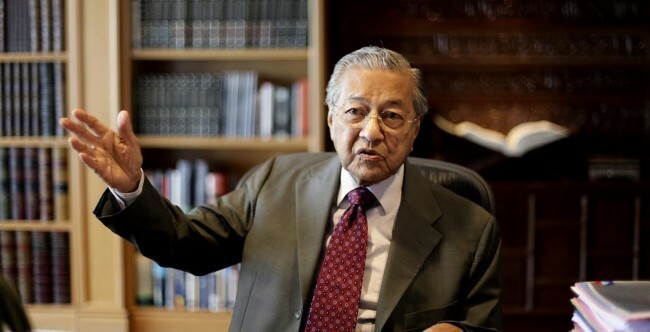 PPBM president Tun Dr Mahathir Mohamad has since reached out to the motorcyclist. The other victims include her husband and a police officer.